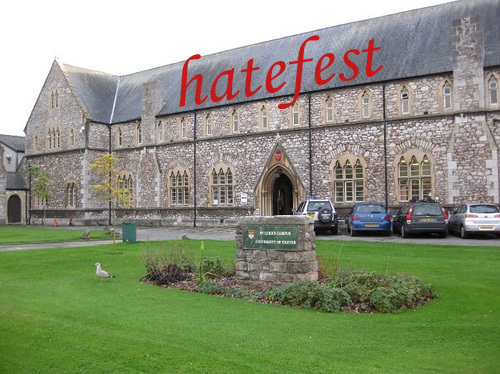 I have just returned from Exeter, where the university held a 3-day conference discussing ‘Settler Colonialism in Palestine’. Far smaller and less organised than the conference that the University of Southampton cancelled, this collection of anti-Zionists ranged from well- known ‘academics’ from the US, Beirut and Australia to several ‘wannabees’ currently working on research at Exeter; these ‘wannabees’ are Ilan Pappe’s academic children. I always engage these ideas, however far-fetched or obscene they may seem. Solely reading pro-Israeli output is little more than patting yourself on the back, and real challenges to what we consider as truth will rarely come from within. If you ferociously challenge your position with external and conflicting viewpoints, it will either survive or crumble on merit. So for me, an opportunity like the Exeter conference, a 3-day anti-Zionist festival, molded into place by Ilan Pappe was difficult to resist. A real life case study into the workings of some of those who truly hate the State of Israel, or in some cases, those that simply hate the entire gene pool of the people behind Zionism. Having spent so much of the last decade in university, I have learnt to become highly selective over which academics deserve praise. For what is true, certainly in these areas of pseudo-science, is that the research is often merely a reflection of the bias of the academic. There is a simple fact, not one of the rabid anti-Zionists at the conference was a Zionist who was converted to an anti-Zionist position through their research, this, because they all hated Israel from the start. This is the way modern academic study in these fields work; first you have the idea, then you learn how to account for it academically. The concept of right or wrong in these matters does not exist. As long as there are people willing to fund, print and read your output, any old nonsense will do. Where there is Islamic funding, and a dislike of Jews, the sky is the limit. The issues around the conference were well advertised and in an attempt to avoid having pro-Israelis visibly protesting academic freedom from university to university, the JLC and the university came to an agreement that put paid to all and any opposition. Not just for this conference, but for the ones that are yet to come. I am sure the political voices behind the agreement will try to sell this as a success, so too will the two Zionists, Alan Johnson and Gabriel Noah Brahm, who were at the conference. Having done the deed, it is now their job to tell everyone it was the right thing to do. This is nothing personal against either Alan or Gabriel, who I felt sorry for and who had the misfortune of being the most hated men in the room. They tried to do exactly what they said they would, and if they believe it succeeded it is down to sheer naivety and a misunderstanding of the type and level of hate in the opposition. I briefly spoke to Alan, a man whose manner, knowledge and politics are built for the era of Oslo. Unfortunately, this isn’t Oslo; this isn’t any type of peace process and these people have no intention of negotiating anything. This is war. The idea that somehow this action promoted or supported ‘academic freedom’ is absurd and if those involved use the words ‘academic freedom’ in explanations of their attendance, they are simply insulting the intelligence of those reading. Geoffrey Alderman’s piece in last week’s JC, further demolishes the JLC’s entire position. Right or wrong, academic freedom was thrown aside and this was blatant interference. These two Zionists were politically imposed on a room full of people who already believe that Zionists control the world, and yet they cannot see how their attendance reaffirmed, rather than challenged the position of those attending. Stunning. I spoke to many delegates, all unaware of my political position, and I know *exactly* what these people thought of their two ‘Zionist infiltrators’. This cannot be sold as a victory. I do not believe that since 1948, when Israel declared its independence, has Zionism been reduced to such beggar status within these Islands. Zionism, pleading to be allowed to be heard in a small room with a bunch of insignificant but rabid haters. And our ‘leadership’ chose this route? Of all of the options open to us, including simply letting the hate-fest occur and disappear into nothingness, this embarrassing episode that reduced us to unwanted beggars was simply a self-defeating disgrace. This conference took place with a Zionist seal of approval and with a guarantee of more to come. The worst of all worlds. This was a room full of antisemites and anti-Zionists, people who believe in the global conspiracy of Jews. The delegates mingled and networked in the gardens and cafe, there was talk of furthering the BDS cause in the university and many haters of Israel got to meet others of a similar mind. They were not there for anything else. These speakers are part of the war machine against Israel and the delegates are all soldiers fighting for the cause. What on earth is there to talk to them about? Within the paradigm of ‘Settler colonialism’, this disgraceful pseudo-science, Zionism does not even exist. Jews are no more than Europeans seeking more land, with the intention of setting up camp and making the natives disappear. Zionism therefore becomes a false flag episode. In this theoretical environment, the narrative itself, the historical context, the description of events, the ‘who fired first’ argument, all become irrelevant. The two Zionist stooges were reduced to sitting amongst the delegates, firing a single question after almost every speech. During Friday, they diligently kept to task, but by Saturday, perhaps realising the futility of it all, that energy had waned and several speakers were let off without critical comment. To highlight the futility, Gabriel Noah Brahm asked a speaker whether the other narrative (the Zionist narrative) can exist within the paradigm, the answer was clear, ‘no it cannot, I don’t buy it, the entire idea of two narratives is false’. I wonder, as the applause to the simple response died down, whether the two pro-Israeli academics began to understand it was pointless. Without wanting to insult them, there is a scary naivety to the argument put forward by the Zionists attending, a naivety mirrored in the very agreement over their attendance in the conference. Our ‘leadership’ does not appear to understand the very basics of the argument taking place on campus. Perhaps this is why things have deteriorated the way that they have. This isn’t even academia. When applied to Israel, the paradigm fails so completely, only blind hatred could hold the pieces together, so from one perspective, perhaps it is lucky there was so much blind hatred in the room. In theory, Kuhn’s paradigm should ‘shift’ when too many unexplainable anomalies render the science unworkable. But Kuhn’s paradigm was a theory involving hard science, not pseudo-science, with Kuhn positing a science that improves itself through revolution. None of this has anything to do with the use of the word in universities today, where pseudo scientists hide behind the word paradigm to invent concepts or apply them in circumstances that have no academic validity whatsoever. Outside of the arena of hard science, and supported only by personal fetish, such false ‘paradigms’ remain unchallenged, and through the creation of conspiratorial explanations, they can sustain themselves indefinitely against any number of anomalies. You can hide anything beneath them and they can be used as an outlet for attitudes that are socially rejected in the mainstream, such as a movement for destroying a democracy, calls for genocide or ethnic cleansing and blatant antisemitism. Hence the conference at Exeter. At the conference itself it took about two minutes to realise the concept of Settler Colonialism isn’t applicable to the case of Israel. It is a historical fact that the Zionists accepted almost every option to share the land that was placed before them. It is also a historical fact that Zionism has released lands in the pursuit of peace. It is also a historical fact that Jews and the land of Israel are not strangers. Paradigm busted. It is only through a denial of the facts, for example a denial of historical ties between the Jews and the land, that the hatred is allowed to continue unchecked. Therefore, Israel’s connection to this paradigm cannot exist in the mind of the rational, which makes the conference itself a deeply disturbing experience. In essence many of the speakers and speeches were similar and on Friday, I had the ‘pleasure’ of hearing anti-Zionists speakers and on Saturday, I heard some more. The basic format was the same, outside of a slightly longer keynote speech, each ‘academic’ had 20 minutes to present a paper followed by a short Q&A session. Within that Q&A session, one of the two pro-Zionists could ask a question. Besides one or two speeches that were interesting case studies, I have heard all of these arguments before. They are the Arab rejectionist policies of the 1930’s-1970’s, almost intact and redressed as an academic exercise. This is pre-Oslo mantra for the faithful, where Palestinians are left excused of any responsibility for their actions and where every Israeli action has a deep and sinister motive. It is frightening in its intensity but risible in its lack of adherence to truth, reality, proportionality and context. Almost all of the facts that would make this nonsensical paradigm uncomfortable were avoided and in conversations with the delegates, it was clear many of these people visibly support terrorists. But there were still a couple of moments, where you could look around and wonder just how these people can be so blind they fail to see the elephants in the room. One such moment was Rosemary Sayigh’s keynote speech on the Lebanese refugee camps. The Arabs in Palestine and their descendants have lived under Ottomans and the British, Fatah and Hamas, they’ve lived in Jordan, in Syria and in Lebanon. Like most people in the region, they have mainly known only persecution and oppression. The *only* place in the entire region that has provided them with shelter, freedom and equality is Israel. This is undeniable and is a stick that gets caught in the spokes of every anti-Zionist argument. Israel is a model the Palestinians should aspire to and it is their rejection of this model that is the truly frightening aspect of all this. This entire argument is not about peace it is about destruction. One other moment of note was with Yara Hawari’s speech on Saturday morning. This is not to engage in a comparison, but merely an attempt to use the perspective of the speaker to place a mirror in front of the argument. Yara Hawari is pleasant, bright and articulate, and also clearly British. Yara describes herself as a British Palestinian, so one can only assume she is perhaps 3 generations down from a Palestinian who suffered during the 1947/8 civil war. Yara is hands on, an activist, and openly describes the IDF as ‘the Occupation Force’. Yara was even reluctant to answer a question from Alan Johnson that she clearly saw as the occupier’s attempt to extract information. Yara speaks strongly on the right of return. Yara is a citizen of the UK, living with full and equal rights, talking about invading and destroying another nation because of what she claims is an ancestral right to her land. So I would ask her this. At what point does your inherited right to return to Palestine end? With your children, with your grandchildren, with your grandchildren’s children? What makes this approach different from the way you perceive the Zionists? Because in reality, the entire academic construct of the conference argument falls flat precisely here. Israel is a vibrant democracy, with millions of citizens who all live and vote freely and without hindrance in elections. This conference claims to represent a dispersed people, living outside of their ‘promised land’, longing for return. But Israel is not responsible for the long term suffering of the Palestinians in Lebanon, in Syria or in Jordan, the Arabs are. Nor is Israel responsible for the fact that 1949-1967 did not see the creation of a State of Palestine. Zionists did not arrive with weapons, they were picked up as a response to a growing and violent rejection of a Jewish immigration. The Israelis have been defending themselves ever since. These people pushing the anti-Zionist cause do not see real Zionism, historical Zionism, but a monster created in their own bias and imagination. And as you look at this aggressive movement, that depicts Israelis as subhuman, that refuses to negotiate, that carries weapons at the borders and wishes to go to Israel to destroy, to uproot and to replace, you begin to wonder if it just might be that when they talk about Zionism, they are describing what they see in the mirror. And as Ilan Pappe took to the floor at the end of the conference to describe the Zionism he sees in his head, George Orwell’s classic ending to Animal Farm came to mind. The University of Exeter must be proud. Next Arlene from Israel: Am Yisrael Chai.